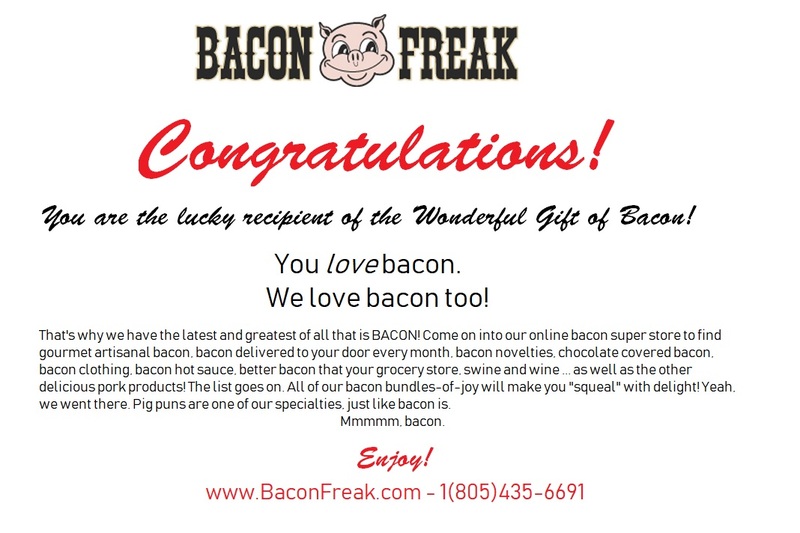 Bacon Freak Bacon is our latest creation and is bound to become our most popular! This traditional cured gourmet bacon proudly bears our "Bacon is Meat Candy™" motto. Our thick cut bacon is smoked over smoldering hickory wood for hours to create a classic flavor that is bacony good! Yes indeed, "bacony" is an adjective straight out of the bacon dictionary. One bite of this hickory smoked bacon and you'll be coming up with your own clever adjectives to describe this product. Unlike grocery store bacon, our hickory smoked bacon delivery will never add water to "pork up" the weight, which is why when you cook a pound of Bacon Freak bacon, you get a pound of bacon! Contains one 16 oz. package of dry cured bacon, mail order delivered right to your door.